I finally put up my Christmas tree today. For whatever reason I was unmotivated to do it earlier in the month. A large part of my lack of motivation had to do with the fact that going into our front hall closet literally takes hours. Everything is nicely organized, but it requires lots of moving of bins and when a 5-year-old is helping it seems to take 10 times as long. I also finished wrapping all the Christmas gifts that needed to be done. Granted some of them were customized by my youngest with 6 different gift tags, but they're done all the same. I wrapped everything in the same roll of wrapping paper, the idea of going back into the closet for the other rolls just wasn't happening. Regardless, the presents are wrapped, the tree is up, and I finished my meal plan and grocery list for Christmas Eve and Christmas day. Overall, it was a productive day and I got it all done before my oldest got home for the last day before holiday break. Now I just have to hope that my two boys don't cause the tree to come crashing down or open all the gifts when I'm not looking (with two boys anything can happen). I've been keeping my meal plans simple the last couple of weeks. My crock-pot has been used numerous times to save time and I love that I have leftovers for at least another meal. This week I tried a new recipe for Slow Cooker Pork Tacos Al Pastor with All the Fixings from the December 2013 issue of Southern Living Magazine. This recipe has 12 ingredients. It takes 8 hours and 20 minutes of total time (including crock-pot time), 20 minutes of which is active, and makes 8 to 10 servings. I did make a few changes to the original recipe. First since I eat gluten free I used gluten free beer instead of white ale. I bought one big can of pineapple tidbits instead of two smaller cans since per ounce the bigger size was a better deal. For the topping I used goat cheese, cilantro and avocado. My boys aren't big fans of radishes so I left them out. This recipe made a lot of food. There was more than enough for my family of 4 plus leftovers for another two lunches. My husband absolutely loved these tacos. They were some of the best tacos he thought that I had made in a long time. I love that everything was done in the crock-pot, making for a quick and easy weeknight meal. The tacos are a little on the spicy side so if you like dishes milder or if you have kids you might want to leave out the crushed red pepper or reduce the amount of chipotle peppers in adobo sauce. Overall a great taco recipe that I would definitely make again in the future. 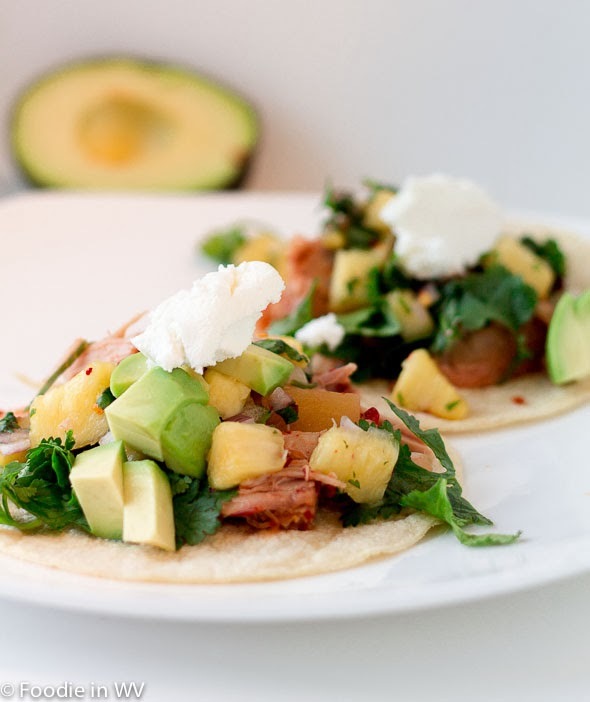 For the recipe go to Slow Cooker Pork Tacos Al Pastor with All the Fixings. A flavorful pork taco recipe that is done completely in the crock-pot. 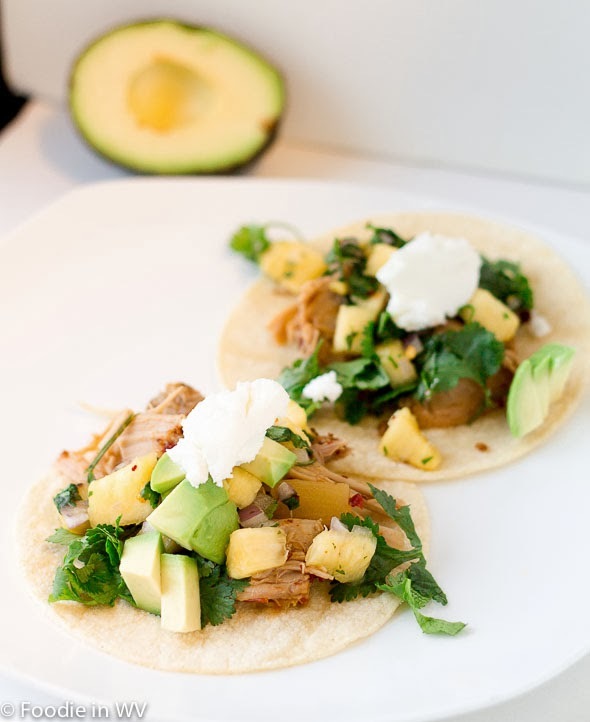 Slow cooking the pork in pineapple and beer makes for delicious and easy tacos! We've used our slowcooker quite a bit lately too, and I love it! Anything can happen, I agree :) I love my slow cooker too, it's great when time is limited! Hubby would love this! I haven't done anything for Christmas this year. No tree, no decorations, no gifts. We're heading on vacation on Saturday so won't be around much to blog visit but just in case I don't make it before Christmas, Merry Christmas to you and your family! I'm glad that I'm not the only one :) Have a great vacation and Merry Christmas! I feel you on the lack of motivation, but with me, it's more that Thanksgiving fell late and I just didn't want to drag everything out for only a few weeks this time.